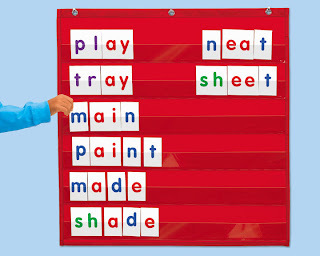 Last post I talked about introducing your child to sight words with the use of your word wall. In addition to teaching sight words, you should also be introducing a few new CVC words every few days. Remember that CVC stands for consonant-vowel-consonant. If you really want to keep the cost down you could write the letters you need on index cards for each word; however, I really like the ease and style of font found in this card set of letters. You also have multiples of letters, vowels printed in different colors, and digraphs, blends, and vowel pairs for later more advanced lessons. This product can be found at LakeshoreLearning.com by clicking HERE. When you are picking CVC words to put up on the wall, remember that they should be spelled with the short vowel sound (ie. CAT, SIP, TAN, PAT). These words are most appropriate for early readers because they can be sounded out letter-by-letter, as opposed to having to know advanced skills that make vowels sound long. Remember long vowels are those that "say their name," such as in the word BAY (the letter a says /ay/). If you are still not sure what words to use, I really like the lists on WorksheetGenius.com. They have a few CVC lists which are divided up by medial sound (vowel sound in the middle). Scroll down to the middle of this link to find the lists by clicking HERE.